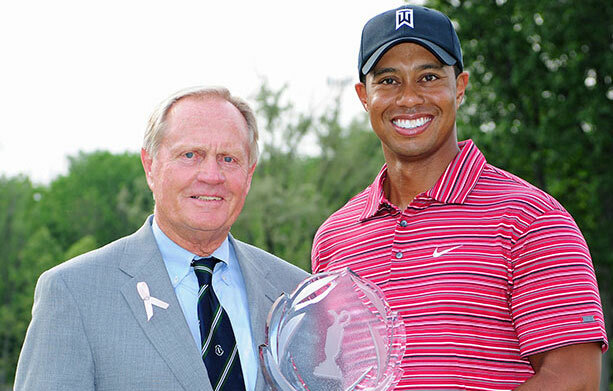 Jack Nicklaus with 2012 Memorial Tournament winner Tiger Woods. The Memorial Tournament presented by Nationwide Insurance tees off today at Jack Nicklaus’ Ohio home course of Muirfield Village Golf Club in Dublin, boasting the strongest field this year for a PGA Tour event. The 120-player field includes World No. 1 Tiger Woods, who returns to defend his 2012 title and try to add to his record five Memorial victories. Led by Woods, the 38th edition of the prestigious invitational Nicklaus started in 1976 includes, in order, the top six from the Official World Golf Ranking: Woods, two-time major champion Rory McIlroy, Masters winner Adam Scott, 2010 Memorial winner Justin Rose, Brandt Snedeker and Luke Donald. The 2013 field also boasts nine of the current top-10 on the FedExCup points list and eight of the current top-10 on the PGA TOUR money list. In addition to Woods, eight past winners of the Memorial Tournament will be returning to Muirfield Village Golf Club, including K.J. Choi, Fred Couples, Ernie Els, Jim Furyk, Kenny Perry, Carl Pettersson, Rose and Vijay Singh. The all-star lineup of competitors also includes 2012 Masters Champion Bubba Watson, 2012 U.S. Open Champion Webb Simpson, and fan favorites Rickie Fowler, Dustin Johnson, Lee Westwood, Angel Cabrera, and 14-year-old Chinese amateur sensation Guan Tianlang. “We are always extremely proud of the fields we are able to assemble for the Memorial Tournament, and this year’s stands as one of our finest,” said Nicklaus, the Tournament Founder and Host. “We have the top five players in the world, and almost the entire top 10 from the FedEx Cup and money lists. We are delighted that world No. 1 Tiger Woods is returning to defend his victory from 2012, and that recent world No. 1s Rory McIlroy, Luke Donald and Lee Westwood have joined him. We have a wonderful mix of major championship winners and veterans, as well as some of the rising stars in the game—from nine past Memorial winners to 14-year-old Guan Tianlang. Jack Nicklaus held a golf clinic at Muirfield Village Golf Club during Wednesday’s Memorial Tournament practice round alongside PGA TOUR professionals. Adding to the excitement of this year’s Memorial Tournament, Chinese amateur sensation Guan Tianlang accepted an exemption to compete in the event. In April, Guan not only became the youngest player to start the Masters Tournament, but he also became the youngest in PGA TOUR history to make a cut in a major championship when he finished 58th. His invitation to the first major of the season came by way of his victory at the 2012 Asia-Pacific Amateur Championship. A native of Guangzhou, China, Guan followed up his performance at Augusta National Golf Club by making the cut two weeks later at the Zurich Classic of New Orleans, where he finished 71st at 4-over 292. This month he missed the cut at the HP Byron Nelson Championship after rounds of 70 and 77. The Memorial is also excited to welcome 2013 Masters winner Adam Scott back to Muirfield Village Golf Club. Making his ninth start at the Memorial, Scott has recorded two top-10 finishes in the event with his best outing coming in 2006, when he finished in a tie for fourth place. Scott has been a model of consistency throughout his professional career, recording at least one PGA TOUR victory in all but three years (2005, 2009 and 2012) since joining the TOUR in 2003. Along the way, he has collected nine TOUR wins and career earnings totaling $30,514,147. Through six events this year, he has recorded three top-10 finishes, including his first-career major championship at the Masters. His dramatic playoff win over Cabrera at Augusta National vaulted the 32-year-old Australian native to No. 3 in the world and No. 10 in FedExCup points. Tournament patron Nilesh Patel came from India to meet Jack Nicklaus. This week’s Memorial Tournament will whet appetites for The Presidents Cup, being played at Muirfield Village Golf Club the first week of October. The club becomes the first in history to host a Ryder Cup (1987), Solheim Cup (1998) and now Presidents Cup.